Tickle your taste buds with this flavorful tart cherry mango smoothie. It’s just as nutritious as it is delicious. You know that feeling when you find a twenty dollar bill in the back pocket of an old pair of pants? That’s kind of how I felt when I discovered a bag of frozen tart cherries buried behind the blueberries in my freezer. Naturally, I made a smoothie with these little balls of flavor the next morning for breakfast. As far as health benefits, tart cherries are perhaps best known for their anti-inflammatory properties. With inflammation being at the root of much dis-ease, cherries are a great whole food for reducing inflammation. Like blueberries, cherries also contain anthocyanins, which provide deep colors and deliver significant antioxidant activity. For those needing a little help getting to sleep at night, tart cherry juice can be a life saver. The other fruit in this recipe, mangoes, are a good source of dietary fiber, vitamins, minerals, and antioxidants. They contain vitamins A, C, E, and K, as well as potassium, phosphorus, iron, and magnesium. Mangoes also help reduce inflammation and research has shown mangoes to protect against certain cancers. This “super fruit” can also be used on your skin to help clear up acne and blemishes. This smoothie was a real treat. 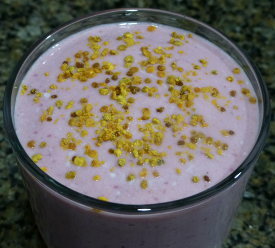 Optionally garnish with bee pollen. Enjoy! Place all the ingredients into your high-speed blender and blend for around 30-45 seconds or until nice and smooth. If you don’t have a very powerful blender and your coconut oil is in liquid form, you might want to blend everything except the coconut oil first, then drizzle it on and blend for another 5-10 seconds to avoid clumping with the frozen fruit. I would love to know if you try this tart cherry mango smoothie and what you thought of it. Please leave a comment below. Happy Blending!